Frog Morton line of pipe tobacco … Click image for larger picture. Frog Morton is a line of distinctive pipe tobaccos from McClelland Tobacco Company, of Kansas City. Among pipe tobacco aficionados, McClelland enjoys a deserved reputation as a purveyor of fine specialty or “boutique” tobaccos, such as their Frog Morton line, or the strong and aptly-named blend “Mississippi Mud”. The History Channel did a 2006 special on Tobacco. You can always catch a re-run. They included a sequence on pipe tobaccos. History Channel singled out McClelland’s KC packaging facility and delightfully imaginative product line-up. 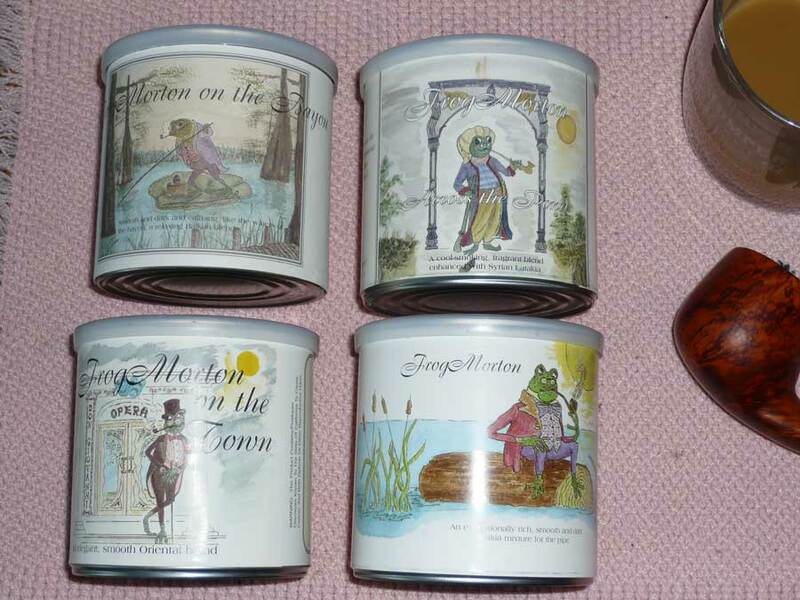 I was pleased to see both the Frog Morton and Mississippi Mud brands featured. It helps a little to de-code the descriptions in tobacconist jargon. “Latakia” is a Syrian blend originally produced in the Syrian town of Latakia. Dark black, earthy and strong, Latakia smells vaguely like a calamine preparation. Smoking it straight is usually considered over the top; it is a blending tobacco. “Oriental” seems to refer to a quaint colonial notion of the British Empire that the orient consisted of the region of Turkey, Syria and such – what we today call the “Mideast”. The “Balkans” refer to the mountains and peninsula of southeastern Europe, including Serbia and Turkey. “On the Bayou” is heavily flavored with Louisiana Perique, a tobacco concoction prepared by soaking tobacco like rotting leaves in a puddle, until black, and then compressed, dried and flaked. The preparation is actually much like that of Latakia in the old world. The results is an earthier mixer. Used judiciously, it also makes for a pleasant and distinctive smoke. I have used small quantities of Perique in my own earlier blends of “Alex’s Mix”. I also tried adding Latakia to the blend, but, finding the Latakia overpowers the Perique, ended up using only Latakia in my mix. I find all of the Frog Morton line to be pleasant smokes, and generally will smoke one or the other as a dessert or after-dinner treat. I do prefer the original “plain” Frog Morton, which is not quite as complicated as others in the Frog Morton line, and probably will stick to this original Frog when re-ordering. I don’t have the lingo to answer the tobacconist question “but what does it taste like?” What does a honeydew melon taste like? At some point, you just have to buy one and try it. I can tell you that my own mixes (25% Latakia) are pleasant and medium-strong, sweet without a hint of artificial sweetness. and draw enthusiastic unsolicited compliments from perfect non-smoker strangers. Of the four “Frog” blends, then, it being noted that I already lean toward a less complex Latakia-based blend, I find the Perique treatment interesting but a little out of balance for my palate and sense of smell (you can smell the Perique in the can). Of the Syrian and “Oriental” blends, I know much less, but for my taste the verdict is the same as for “On the Bayou” – interesting, but I still prefer the original Frog. Frog Morton, then, would be stronger without being harsher, a pleasure to the very bottom of the bowl, a blend I could heartily recommend pipe smokers try when they are looking for something familiar but pleasantly different at the same time. I’ve added a number of pipes to the collection this year. I have over a dozen of my favorite Nordings, so have been on the lookout for interesting new designs with smaller “dessert” sized bowls. 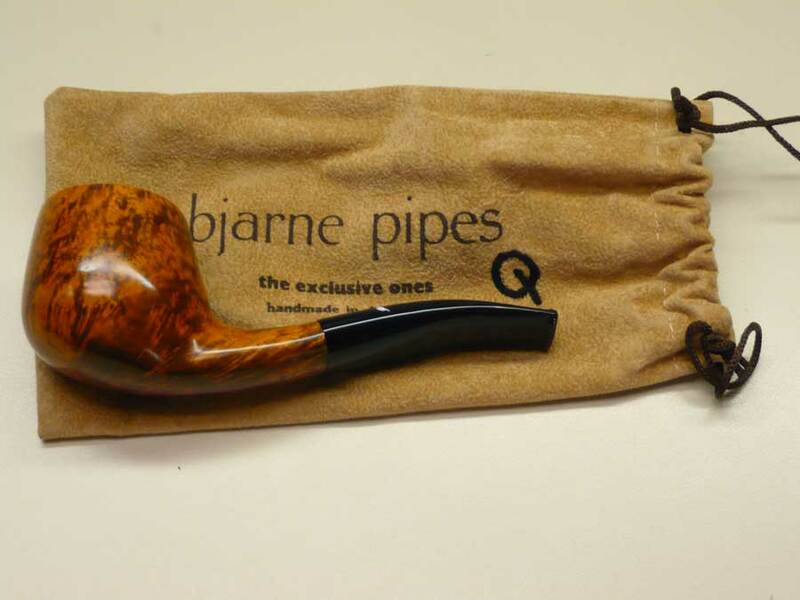 And, sadly, Mr. Bjarne of Bjarne Pipes passed away this year, so there will be no more of those excellent smokers when the existing stocks sell out. Here are three of my new additions. This little beauty has a really nice grain and promises to be a good smoker. Here is a really nice woodgrain with a 3/4 bowl, sure to be prized, and already a good smoker. 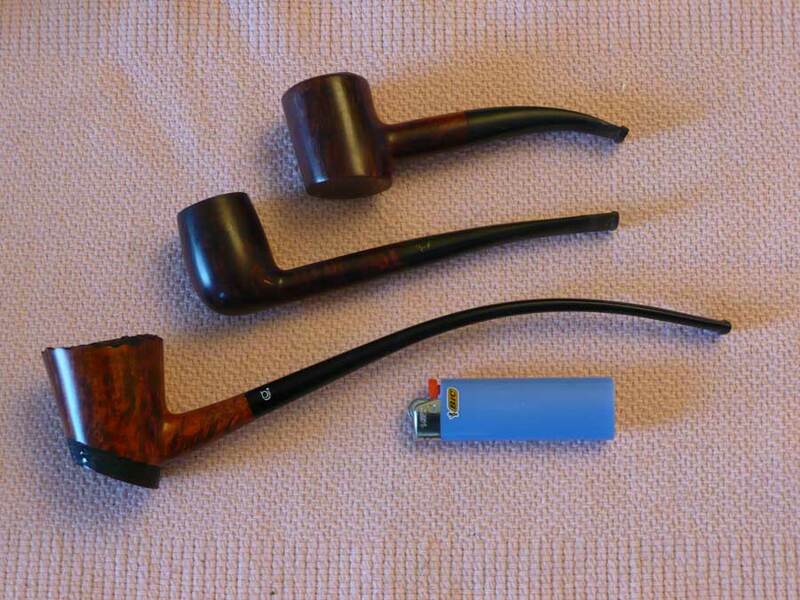 (Bottom) – Compared to a “Bing’s Favorite” I used to call a churchwarden, and my even smaller Dunhill poker. The Bjarne is really a sitter – it sits, no doubt thanks to its generous bowl ballast. This is just the smoker for the living room couch, when you don’t plan on moving around and can cradle the bowl in one hand. You would not walk around with this clenched in your teeth, and the long stem leverage would pry open your jaw if you tried. I believe it will become on of my best smokers. 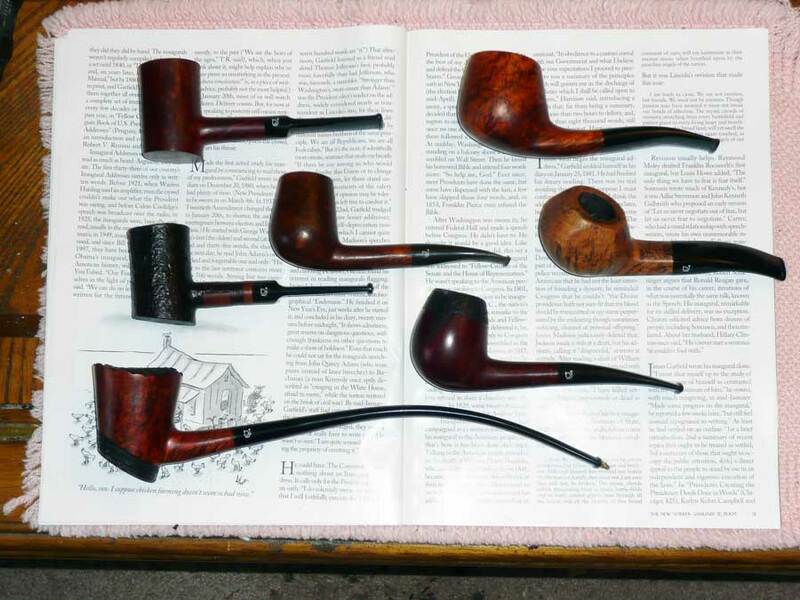 We’ve expanded our Nording pipe collection some since our last post on this topic. All are great smokers, but we have our favorites even among these. You can click each image for larger files. We’re also partial to Bjarne “Poker” style pipes. We added a couple of these, the smooth and sandblast, pictured below — above the one pet Dunhill in our collection. They are both real pleasures to smoke, and often get the honors of the first smoke of the day. The Dunhill was one of our earliest purchases and remains one of the best smokers of all. In the top photo it looks like it’s time to clean the stems again. Nordings all come with hard rubber stems, which tend to collect grime faster than acrylic stems. After trying a variety of things, the best method we’ve found is the old-fashioned hand scrub brush and a little dish detergent. After washing, the stem then has a dried-out dull grayish appearance. We used to use olive oil as is often recommended on the hard rubber, but switched to ordinary hand lotion. It’s less oily, absorbs completely and doesn’t smell like pan frying. Hi, thanks for writing. You have a lot of good questions and I’ll try to address one at a time. First, most of what I know, I learned from browsing the pipe forum http://forum.pipes.org/. It looks like they have reorganized somewhat since I was last there. There is a parent page http://pipes.org/ which also has a lot of interesting links. I own a Big Ben and am quite happy with it, though it isn’t quite broken in yet. Most of my “regular” pipes are Nording, about which I’ll have more to say soon. At first I was tremendously taken with the idea of Falcon pipes. 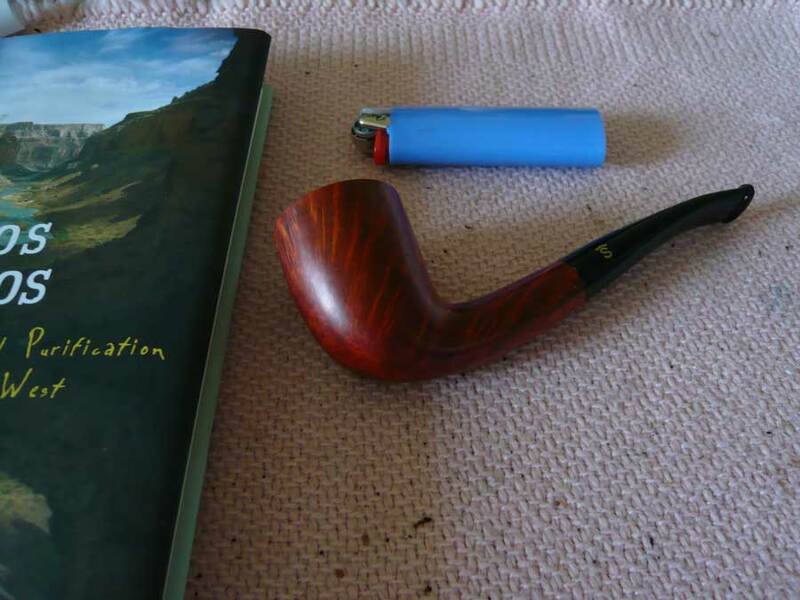 Clean, logical, sensible – yet I found my wooden pipes smoke “better” and I am not sure why. I have a number of Falcons but rarely smoke them any more. You can do a better job of cleaning them, but it takes a little longer. You hold them by the wooden bowl, though the aluminum stem does not get that hot. The Nordings that I vastly prefer are all relatively heavy pipes made of massive amounts of better grade briar. They smoke cooler, probably because of their size and mass – Falcons are lightweights and heat up quickly. Nording makes a big variety of pipes and styles. Mine are the “orange” briars, a little hard to find, and a little more expensive. They run around $100 or a little under. They are all well broken in and by far the best smokers I own. The lighter, less expensive Nordings are not bad and sometimes you can get a set of 6 for under $50. I ordered a couple of Meerschaum bowls for my Falcons back around 2004 but never really cared for them. I also ordered a Meerschaum clay pipe. They all taste like they are never broken in – you don’t want a cake in them, they say. I like the cake. I never got the hang of them and abandoned that experiment, though others swear by them. Switching tobaccos in the same bowl is said to not be a good idea and I found through experience that I agree. A bowl acquires a “flavor” quickly and it takes a long time to change it. I like them smell of many aromatics but they don’t often taste as good as they smell. Many additives make me cough – what the veteran pipe smokers call “casings” I think. Commercial mixes like Rum & Maple are so heavy with casings that, to many pipe smokers, the casings interfere with the tobacco experience. My current order formula: 1 lb Medium Burley from Altadis, 1 lb Lane Limited BCA black cavendish, 1 lb Latakia blending pipe tobacco, and 2 lbs Lane Limited HS-3. I experimented with Perique, but went with the Latakia, which complements and defines the full flavor in a very satisfactory way. I am very happy with this mix and have stayed with it for over a year. I still order my bulk tobacco from Habana (PipesandCigars.com). Despite a respectable stock of other enjoyable blends mentioned on this page, I rarely smoke them. There is one flavored blend called “Trout Stream” I really liked. But there are really so many fine blends out there, both “straight” and delicately blended aromatics, that my suggestions are just the favorites of one out of tens of thousands of pipe smokers! This topic always reminds me of the youngster who says, “If you like the United States , you should visit my home town” – not because it’s the most representative, or the prettiest, or even a particularly nice place to live, but just because it’s the only one the youngster knows! A cool smoke helps prevent “scorched palate” which I quickly got from the Falcons, and my dental people lectured me badly. I get less from wooden pipes but there is still some. We are not supposed to inhale and I don’t, but you get enough “second hand smoke” to irritate. I have developed what they call a “pipe smoker’s bark” over the years, and I have to lay off or cut back if I get a chest cold. So I sure can’t make any health claims for pipes, except perhaps that is does not seem to affect me as badly as cigarettes which I smoked for 40 years up until the year 2000. I haven’t really posted to my Tobacco page in quite some time, so I might post just my own reply (this one, with no name or address info of course). I do hope some of this is helpful, but the only hard and fast rule I know is experiment, experiment, experiment – and you’re doing a fine job of that! Against all conventional wisdom, I’ve taken up smoking my old pipes again. I like Falcon pipes and a Cavendish-based tobacco mix. Three of my Falcons actually go back thirty years, to the days when I thought Walter Raleigh was great stuff. I would “sweeten” it with orange rinds to disguise the marsh bite and oddly artificial taste. These old pipes, with a decent blend of bulk tobaccos with no additives, are still the sweetest-smoking in my small collection of Falcons. The Falcon pipe system consists of an air cooled aluminum stem and threaded, detachable briar bowls. You can purchase bowls and stems as a unit, or separately, meaning, you can mix and match from a broad variety of styles. I generally use Pazryk Ltd. as my source for Falcon. The Falcons are lightweight, rugged, attractive and well built. One could buy just one stem and swap out dozens of bowls. The threaded briar bowls unscrew readily, so they are obviously easy to clean. These pipes are great for home or traveling. I started 30 years ago with a rustic Dublin-style bowl, an oversize rustic snifer-like bowl, and a smooth straight-walled Algiers bowl. All had straight aluminum stems. I don’t recall the circumstances of this happy purchasing decision. These bowls are thoroughly broken in. They’re incredibly sweet-smoking. I’ve recently added four more bowls, and have a fifth on order. The smaller “bantam” meerschaum-lined bowl is nice for a quick smoke. I believe these fine clay linings need longer to break in, but are never harsh. When I can afford the luxury of stepping outside for a 20 minute smoke, I prefer the larger “Classic” bowls. Every pipe and every bowl develops its own distinctive flavor, even using the same mix — I have not graduated to the ranks of those who smoke different mixes for different occasions. Below are some of the bowls I’m fond of. The FP7121 has not arrived yet. I ended up ordering an individual stem for each Falcon bowl. While this seems to defeat the utility of interchangeable bowls, you can still swap out bowl and stem styles, and I do. Below are a couple of stem styles I use. The bent stem works particularly well with the larger Classic bowls. I received my Nording Freehand from Payless Pipes in November. For only $60, it shows excellent construction and finish, a beautiful woodgrain, and has a larger bowl. It quickly became a sweet-smoking pipe and is already clearly one of my favorites. The deeper briar bowl tended to clog, as the one-piece stem joins the bowl about a quarter of an inch above the bottom. As tacky as it sounds, I drop a small pebble into the bowl before packing this pipe. The draw is much smoother, non-clogging, and the small amount of moisture that accumulates does not make the last of the tobacco soggy. This prized #4120 Dunhill Amber Root just arrived, also from Payless. Only 5-1/2″ long, it has a standard 3/4″ bowl interior. For whatever reason, it was a sweet smoker from the very first break-in load. As you’d expect, finish and fitting is remarkable. Balance and feel are perfect. I can’t say how happy I am to own this pipe. My smoking “breakthrough” was the discovery of golden Cavendish, a popular and aromatic tobacco. You can buy it bulk, and I have found two kinds I like, blends IQ-1 and HS-3 from Payless Pipes – also a reliable source of fine pipes and tobaccos. HS-3 is more or less a “pure” Cavendish. The claim is that no one will not like the smell of a Cavendish. I can see why. Sweet without overpowering, these tobaccos contain no additives or artificial flavorings. It seems that the most serious issues I had with “over the counter” grocery and liquor store tobaccos was these chemicals, fake flavorings and additives. All these years, I thought Walter Raleigh, Rum and Maple and Half and Half were as good as you could get, and yet I could not really bring myself to really “like them”. No wonder! My first step toward discovering real tobacco was a prepackaged blend I can only find at Walgreen’s in Phoenix. “Mellow Blend”, a “Blender’s Gold” product from “Master Blenders”, contains some mix of burley, black cavendish and golden cavendish, which is more or less what I am smoking now. I would guess that it has more burley and less cavendishes than I like best, but it is a fine smoke. This firm also markets “Burley and Black” which I am still using as a mixer. My “mix” is mostly Golden Cavendish, with burley and black added. If I had to guess, I would estimate proportions of 1:2:4. For me, mixing my perfect blend is still a matter of trial and error, but I know it when I get there!